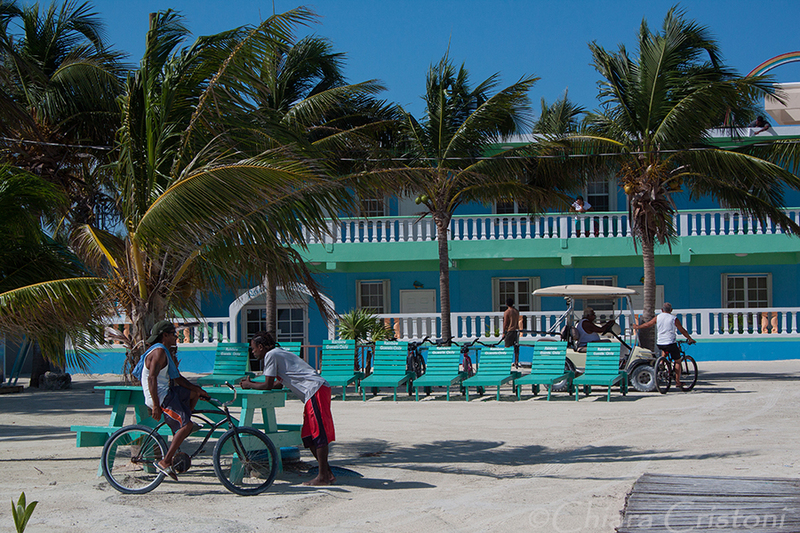 My first impression of the people of Caye Caulker was: everyone looks Jamaican and is a rastafarian. 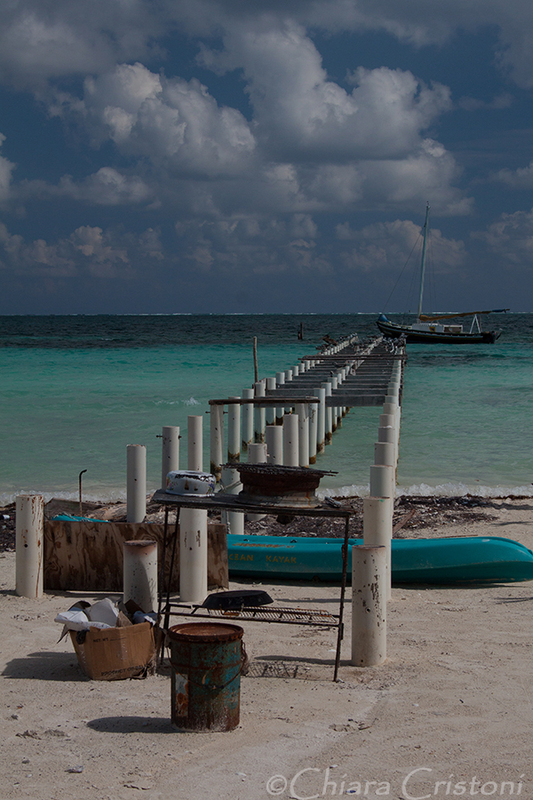 A striking difference from mainland Mexico, from which I had arrived. 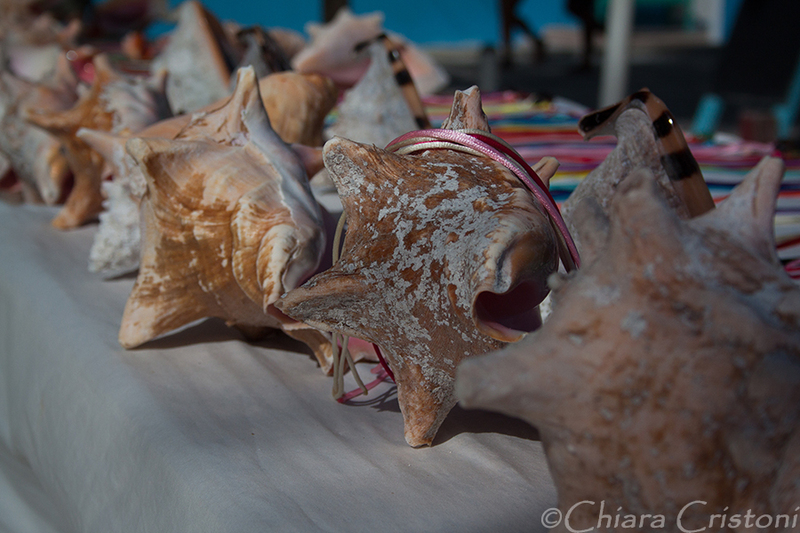 In my few days on the island I got to know a few locals, most of whom hung around the crafts market along Playa Asuncion. 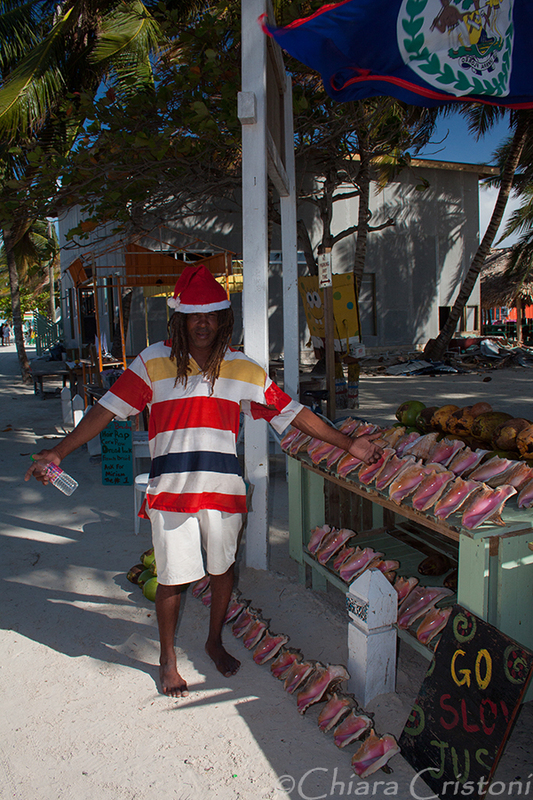 There I met Coco Loco, with his Santa hat. 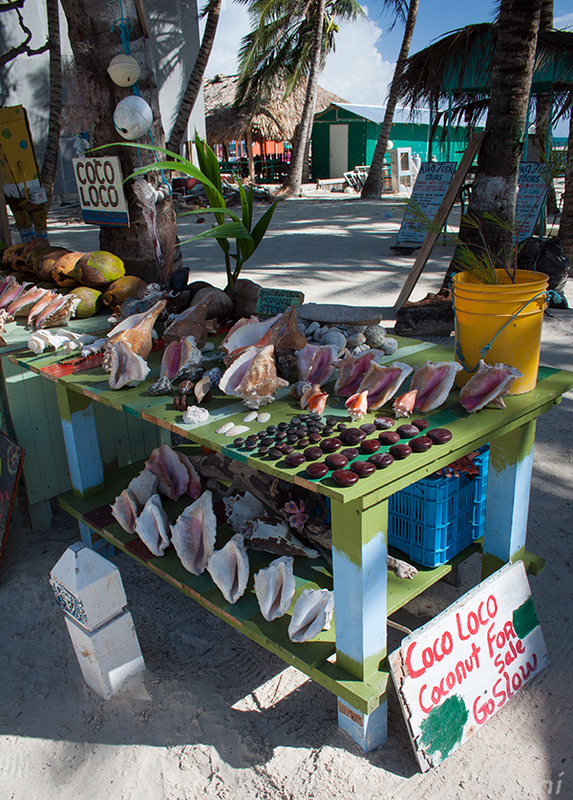 He sells giant seashells. 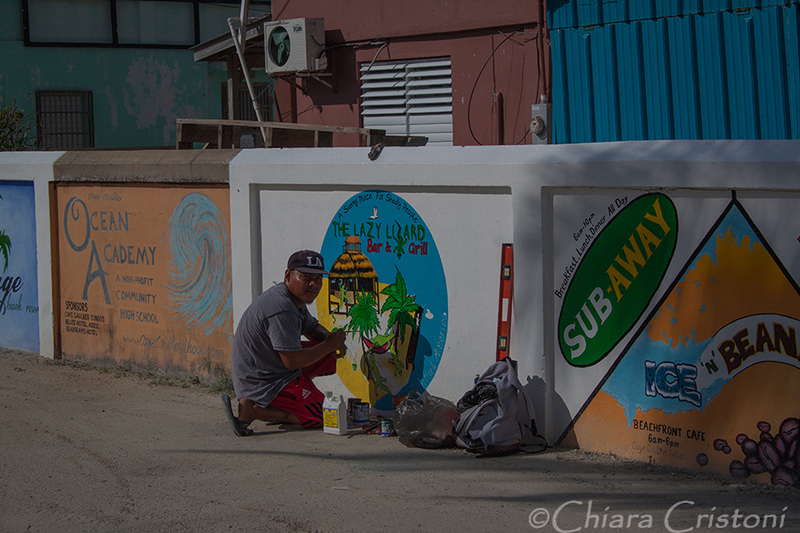 He refused to have a photo taken until I mentioned that I could put the photo online and make him famous. 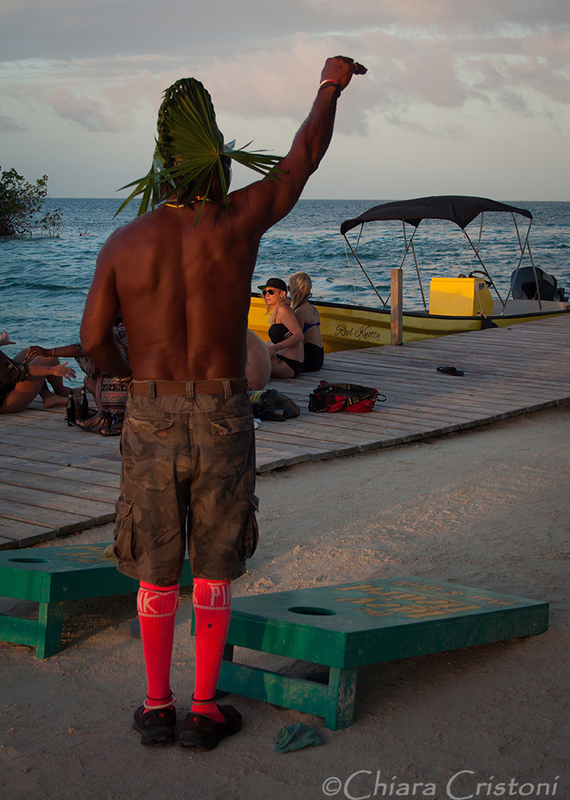 At that point his attitude changed and after eagerly asking “Are you going to put me on YouTube?”, Coco Loco was more than happy to pose. So here’s to you, man: it’s not YouTube but only my humble blog, yet you are now on the internet! Then there were Debra and Rootsman. 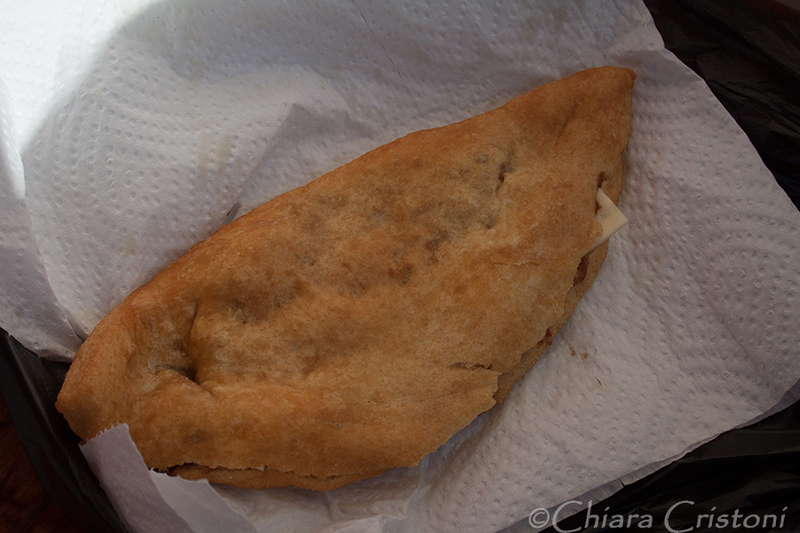 They live in the north island and sail to the south island everyday (10 minutes or so) to set up their stall at the crafts market. 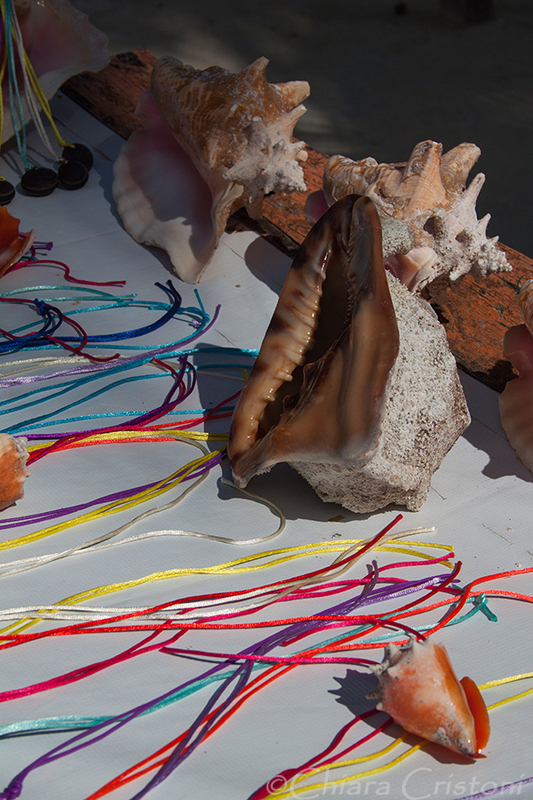 Debra makes jewellery out of shells, seeds and motherpearl. She explained to me her choice of material and added that most pieces she makes are unique, all different from one another. 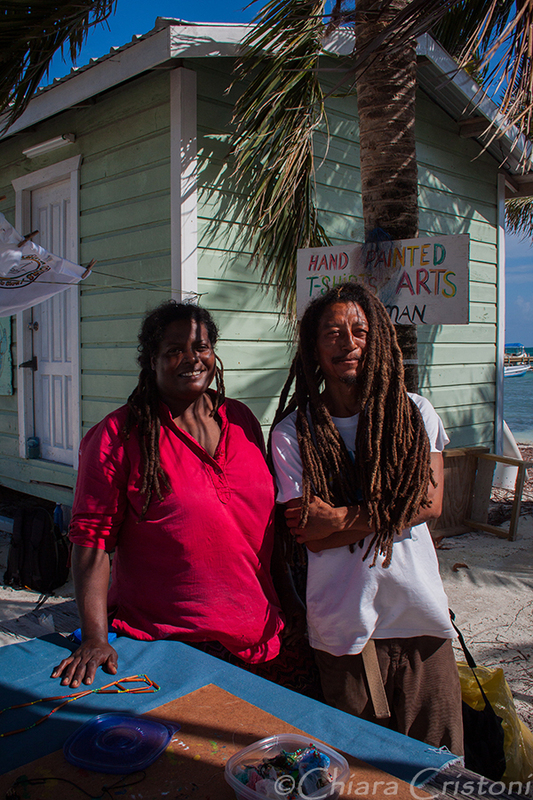 Rootsman handpaints t-shirts. 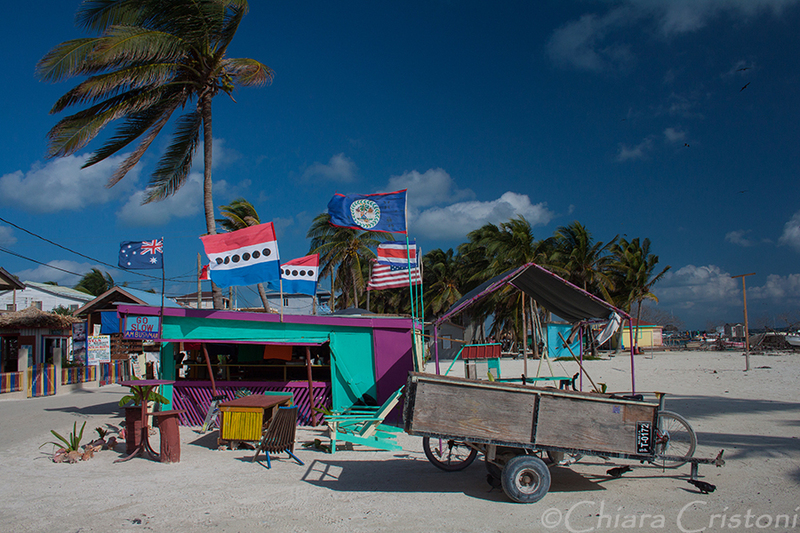 I had a long chat with them about their crafts as well as Caye Caulker. 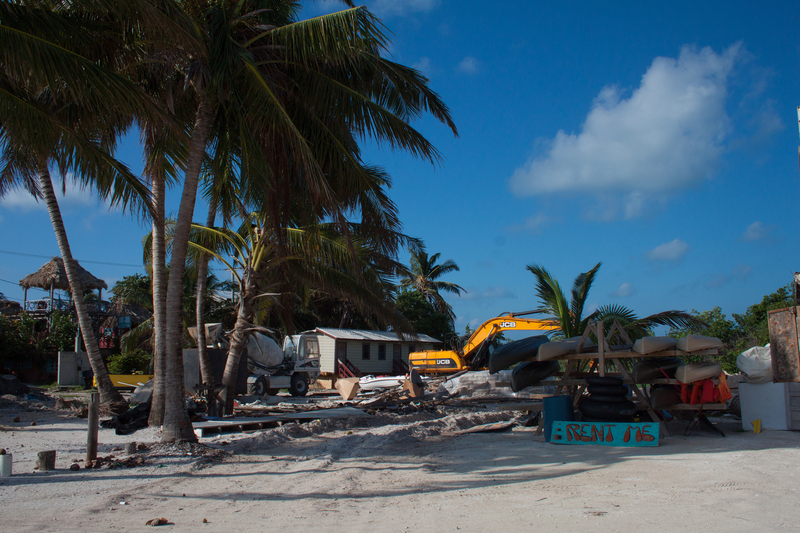 They expressed their fears about the island becoming increasingly touristy and heading towards what nearby San Pedro has become. It will be very sad if/when it happens. 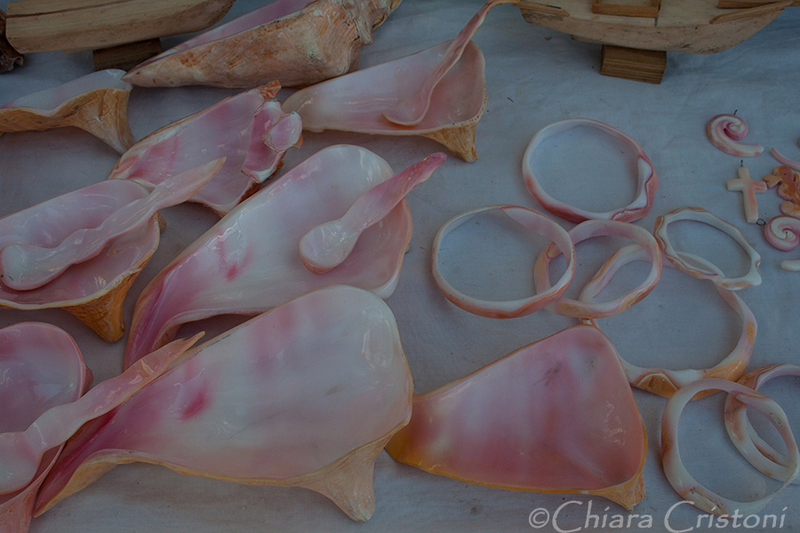 There was a guy from a stall advertising diving/snorkelling who had spotted me because of my camera and my photography activity around the market, and had therefore nicknamed me “the photographer”. He’d call me everytime I walked past so I’d always greet him in return. 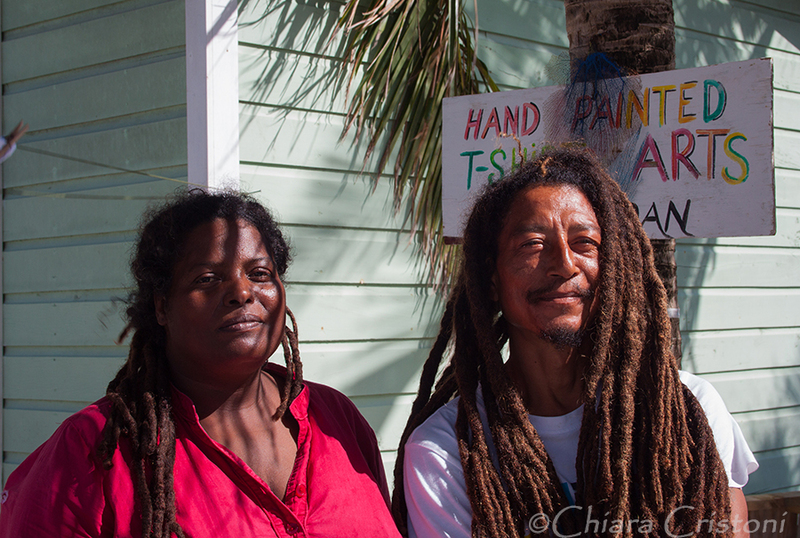 Another artist asked me to have his photo taken, then complained that he looked like his brother! As a woman you also get a lot of unsolicited attention from the local guys. As they walk past you they will greet you with “Hello beautiful”, “Hi baby, come over here” and so on. 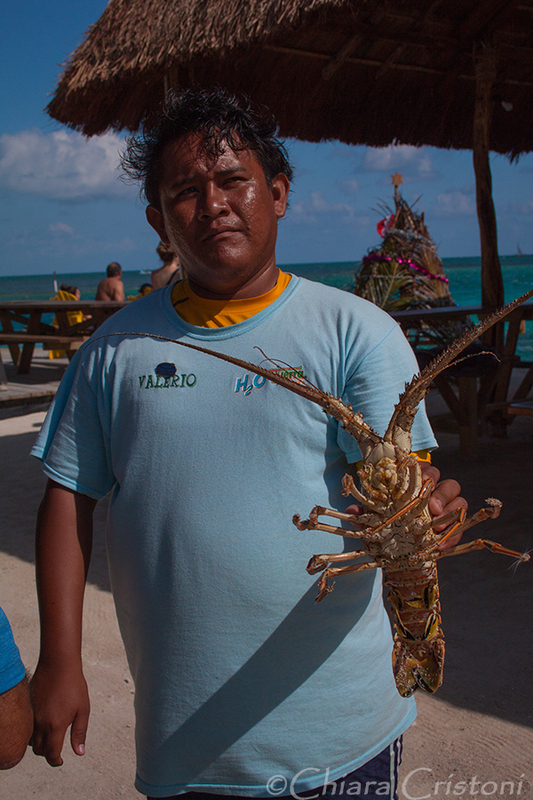 After a couple of days on the island, most of these guys will know you and remember you, they will greet you by name when you bump into them. 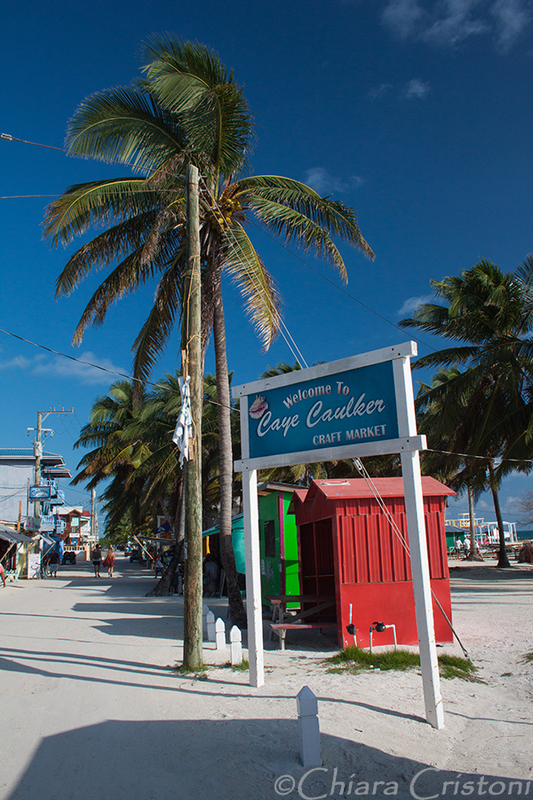 Because you will, and many times: Caye Caulker village is very small. 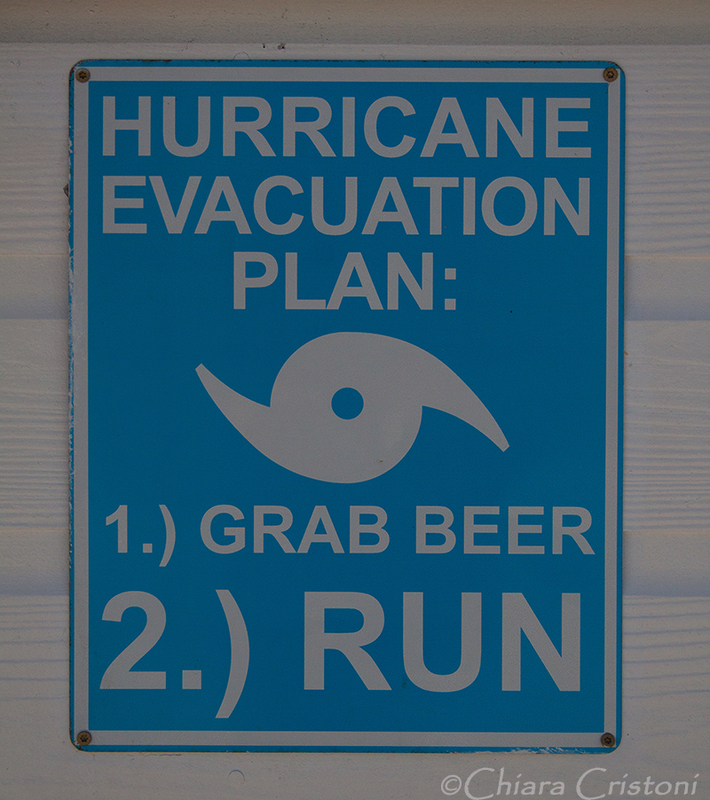 It can be annoying or fun, depending on your mood. 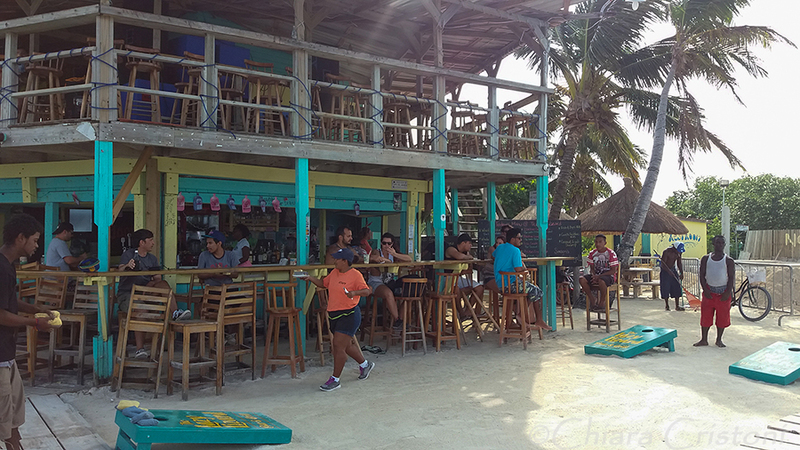 I chatted to a few because I wanted to hear stories about Caye Caulker but always walked away quickly if they became annoying. 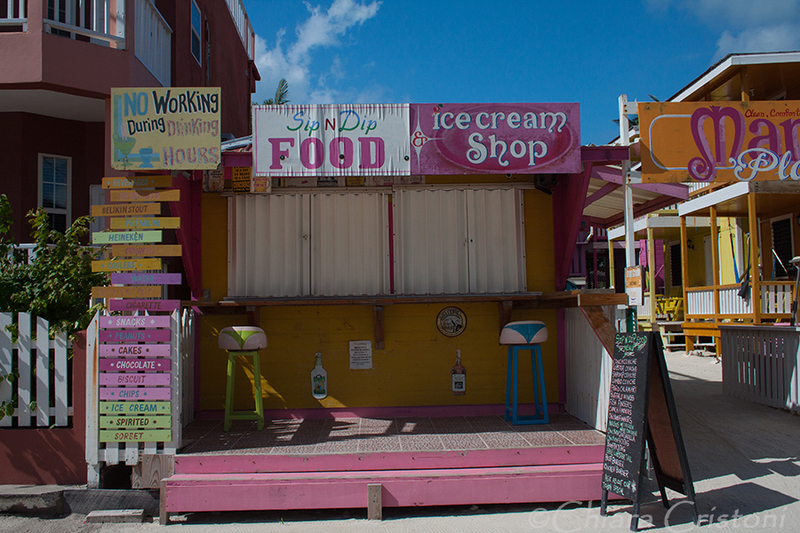 One last interesting fact is that there is a high presence of Chinese/Asian people on the island: they run all convenience stores and cheap supermarkets in Caye Caulker village. Quite unexpected for me to be honest! 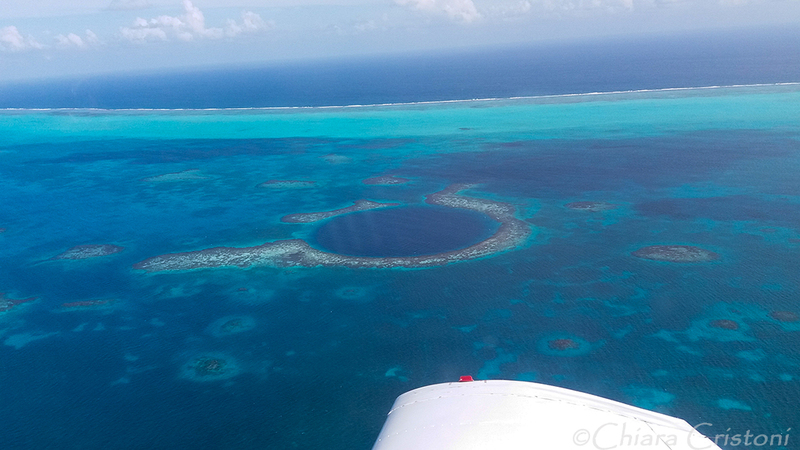 Being someone who rarely splurges money when on holiday, preferring cheap or free activities, the US$200 for the 1-hr scenic flight over the Blue Hole in Belize seemed the result of a moment of madness. 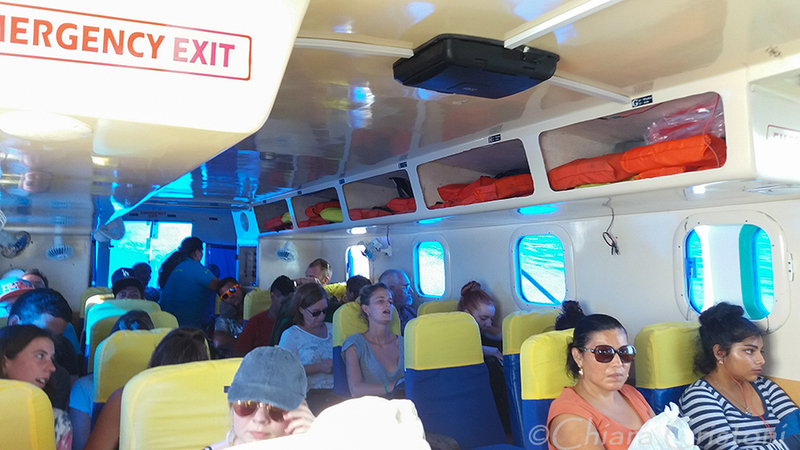 Yet I had chosen this option because I had heard that as a snorkeller, and not a diver, the Blue Hole would be a disappointing experience and not worth the 2+ hour one-way boat ride. Plus, we only live once hey! 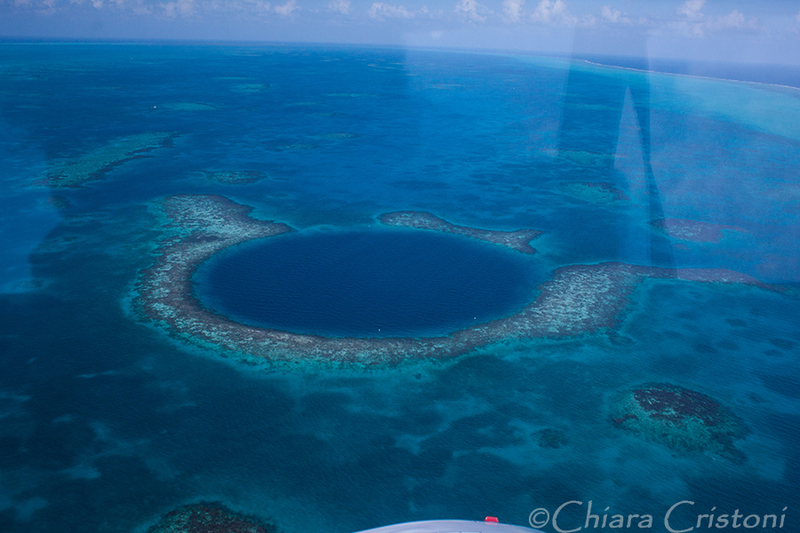 What is the Blue Hole, though? 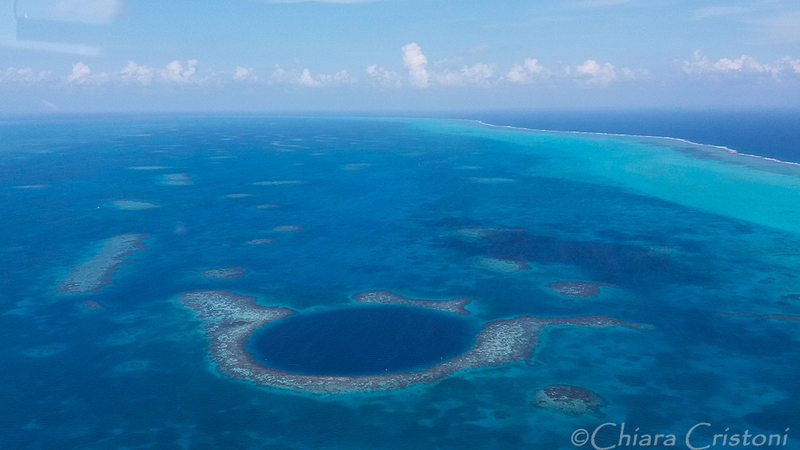 It is a giant submarine sinkhole (like a cenote in the ocean) off the coast of Belize. 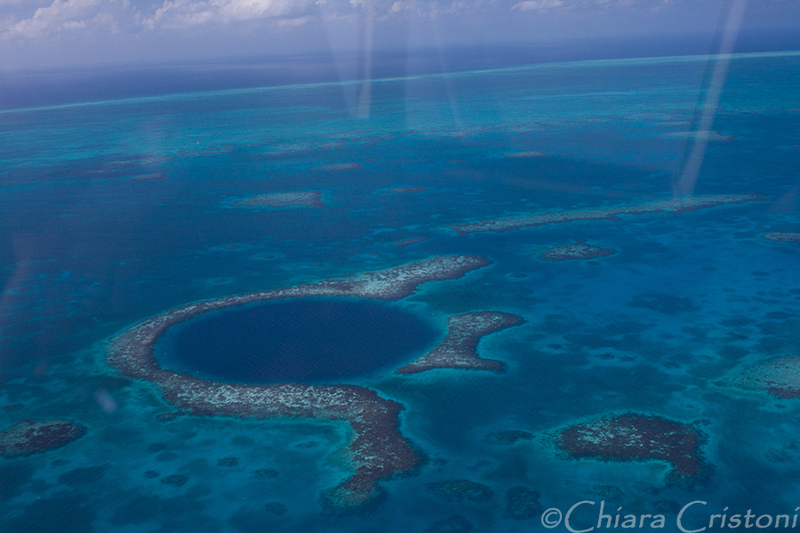 The hole is circular in shape, over 300m across and 125m deep. 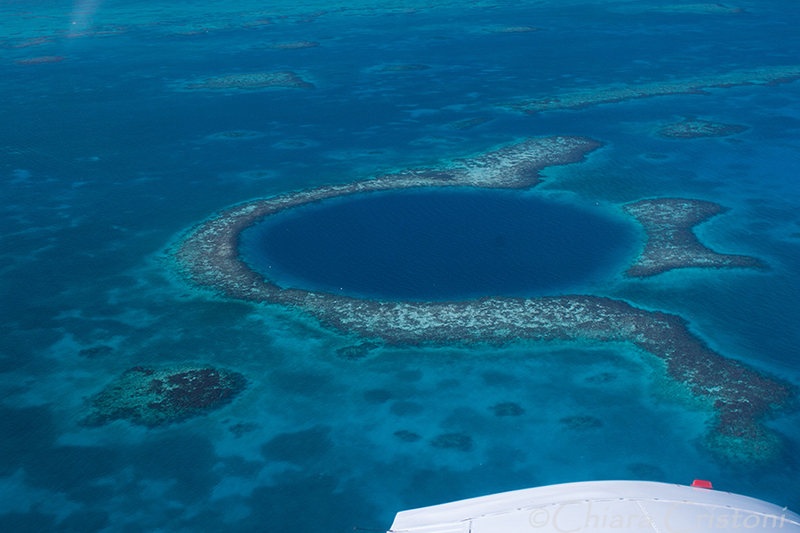 The world’s largest natural formation of its kind, the Blue Hole is part of the larger Barrier Reef Reserve System, a UNESCO World Heritage Site. 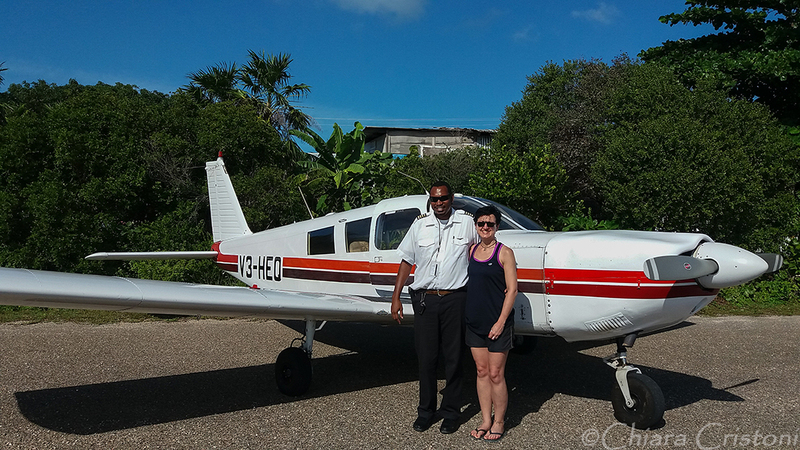 The tour agency I had chosen for this teamed me up with two other female travellers – a minimum of three people is required for a scenic flight to be arranged and I had contacted the agency via email prior to my arrival. 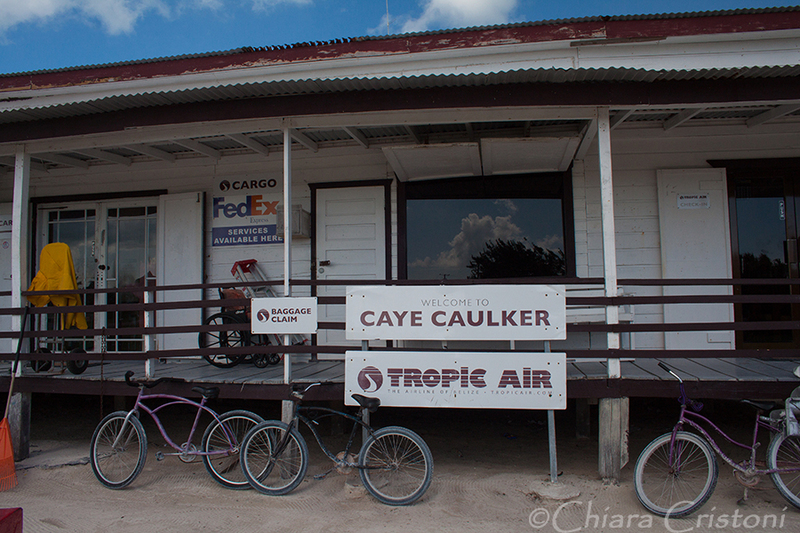 The small 4-seater plane picked us up at the Caye Caulker airstrip, at the southern end of the island. The pilot, very friendly Mr Hoy, briefly ran us through the security basics and the itinerary. 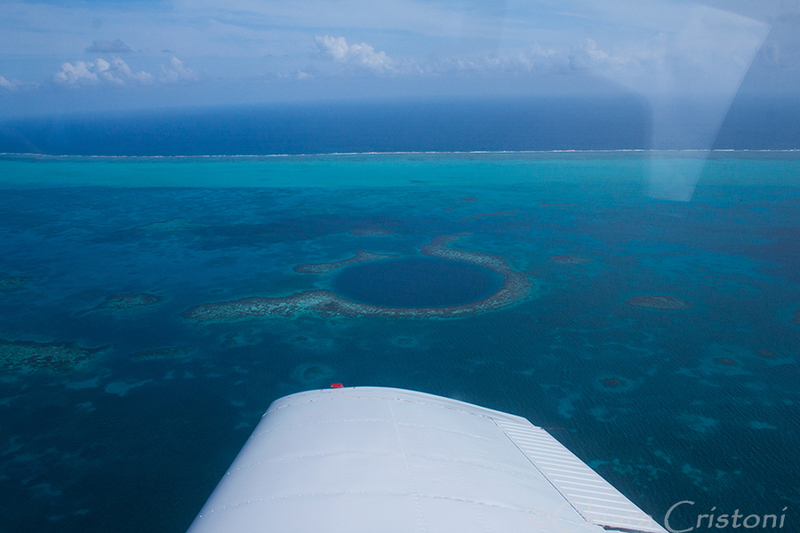 Twenty minutes to get to the Blue Hole, fly twice around the Hole from the left, twice from the right, twice across the middle, then return. All so exciting! I sat in the cockpit, next to the pilot. And we took off. 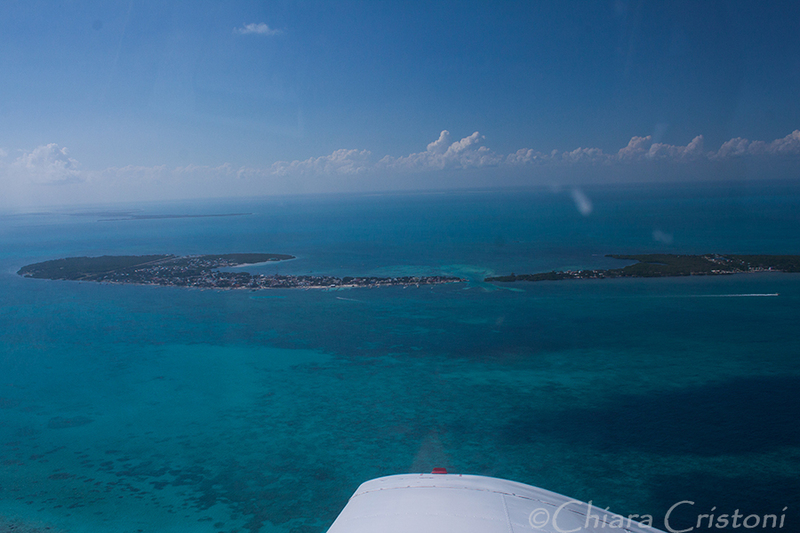 The view of Caye Caulker and its reef from above was amazing but it was only when we got to the reef around the Blue Hole that my jaw dropped. 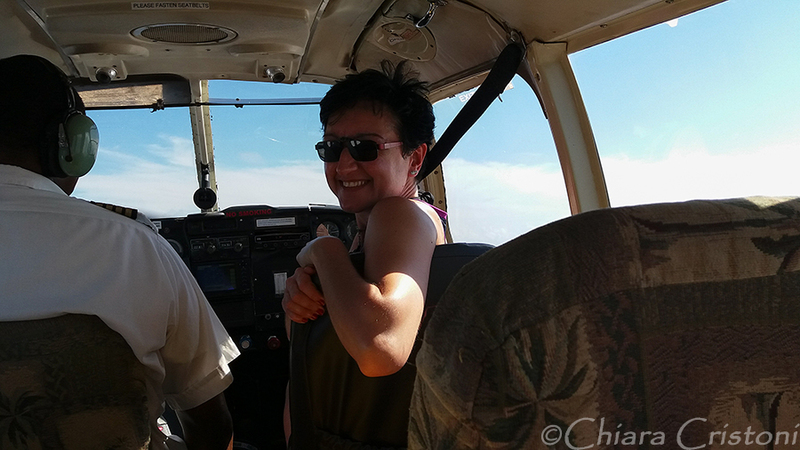 The pilot kept tilting the aircraft to a 90degree angle and my stomach started suffering. 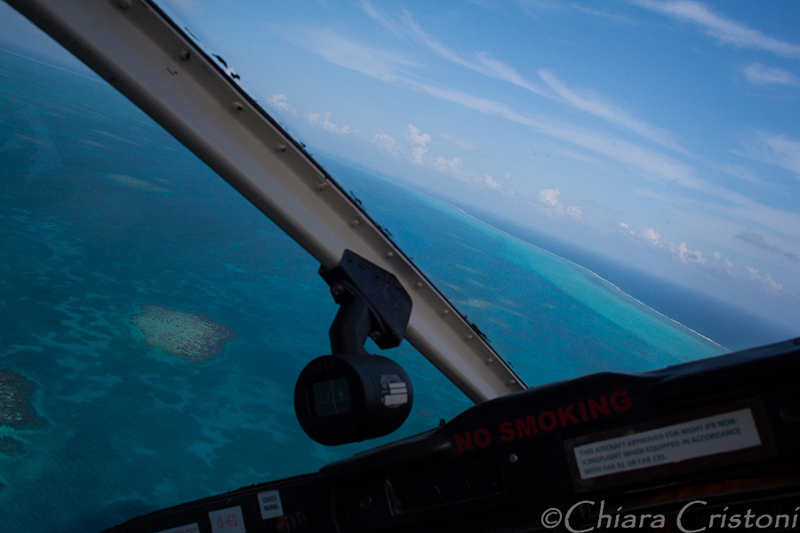 But the view from above was spectacular! 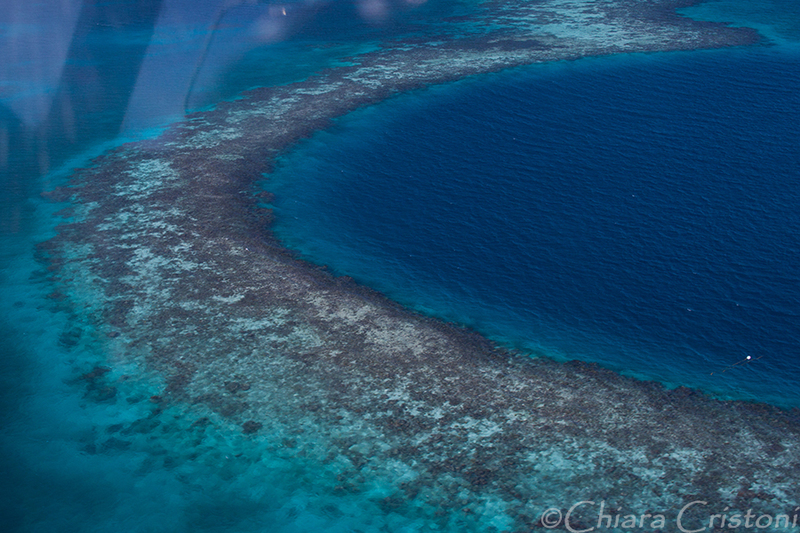 The Blue Hole stands out within the reef because of its dark blue colour and its circular shape. We went round it a few times, descending very close to the water at times. It felt as if we could almost touch it. Such an incredible feeling! 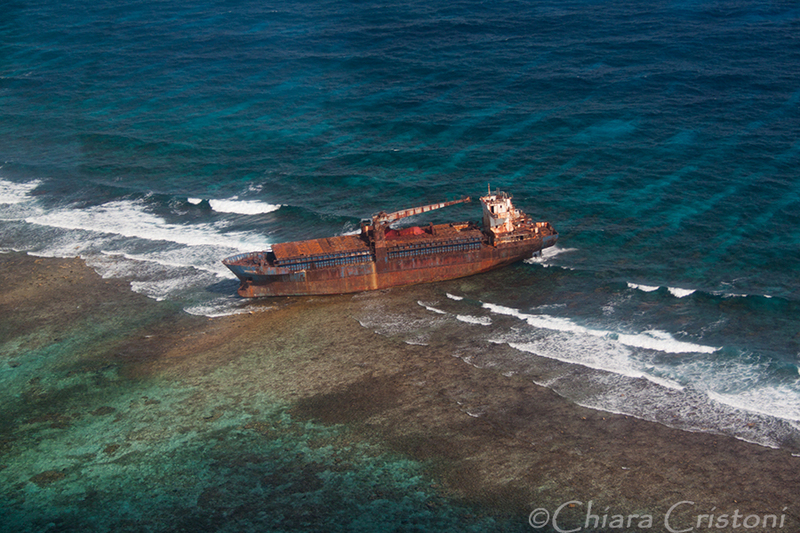 On the way back we circled around a shipwreck stuck in the reef. The photo opportunities certainly didn’t lack. 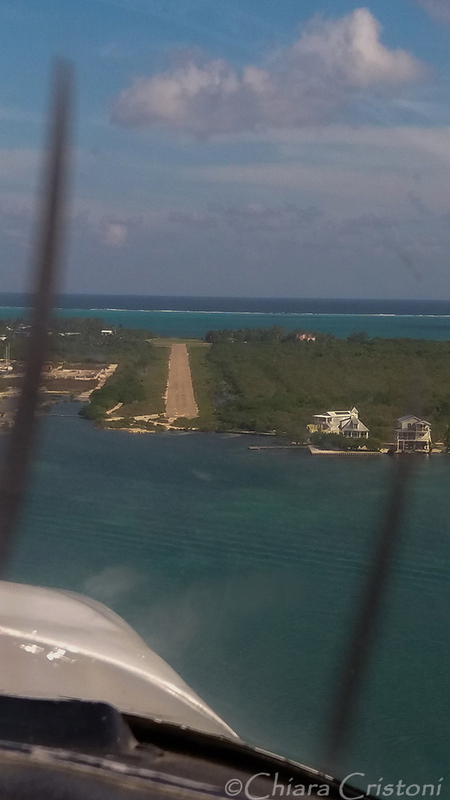 When I saw the straight line of the Caye Caulker airstrip appearing in the distance I was sad that the flight was over. But it had indeed been worth every cent spent on it! 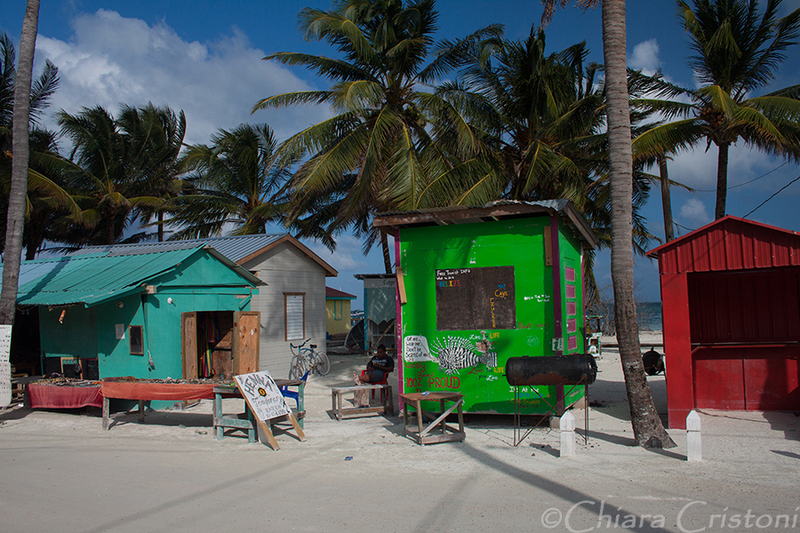 I fell in love with Caye Caulker the moment I got off the water taxi, in a mild December evening. 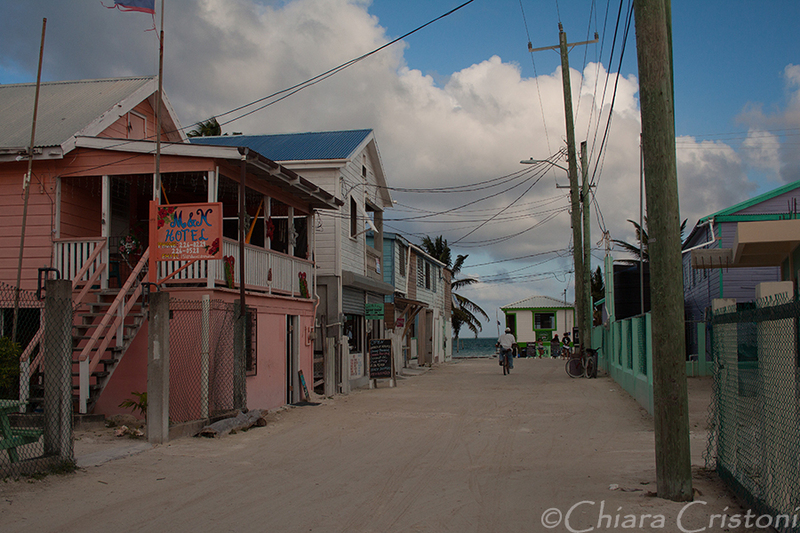 White sand under my feet as I walked down the street looking for my guesthouse, houses in pastel colours, locals cheerfully welcoming the new arrivals to the island, music everywhere, a strong Caribbean feel. 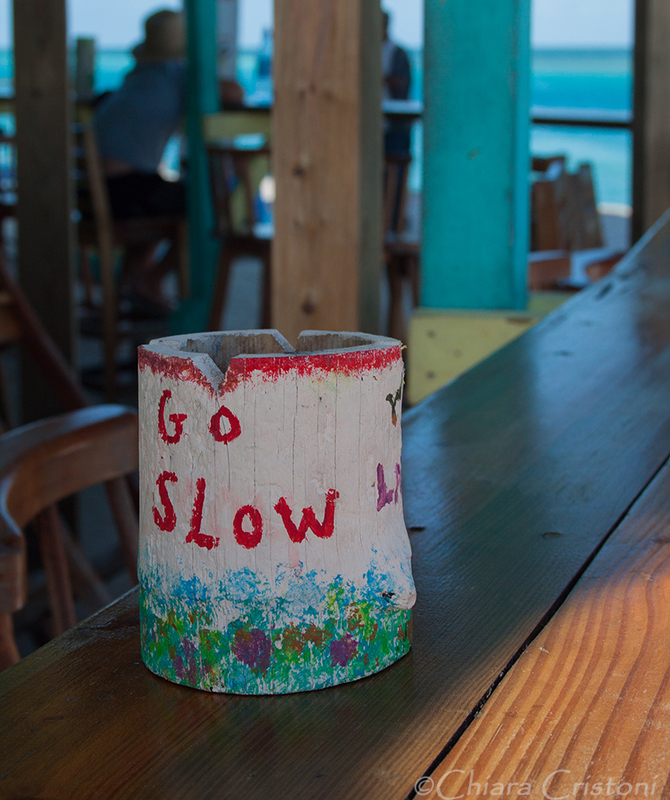 Go Slow is the motto here. Everything is relaxed, very laid back, no one rushes. 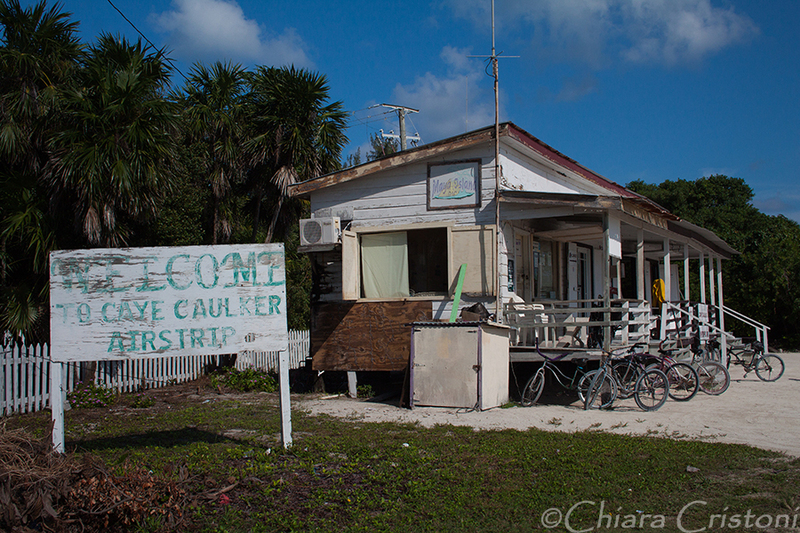 There are no cars in Caye Caulker. Everyone walks or cycles everywhere. If you want a taxi you’ll hop into a golf cart. 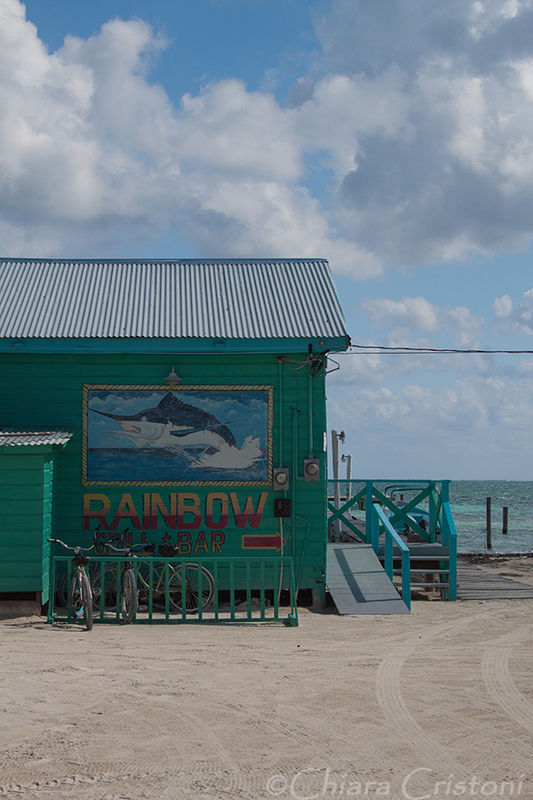 There isn’t much to do on the island, and there is a lot to do at the same time. 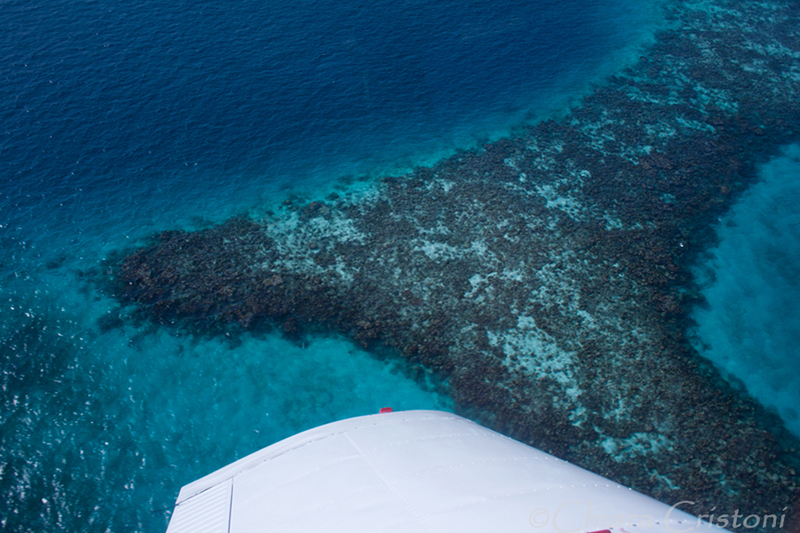 Plenty of tour agencies offer diving, snorkelling, kayaking, paddleboarding, scenic flights, boat tours. 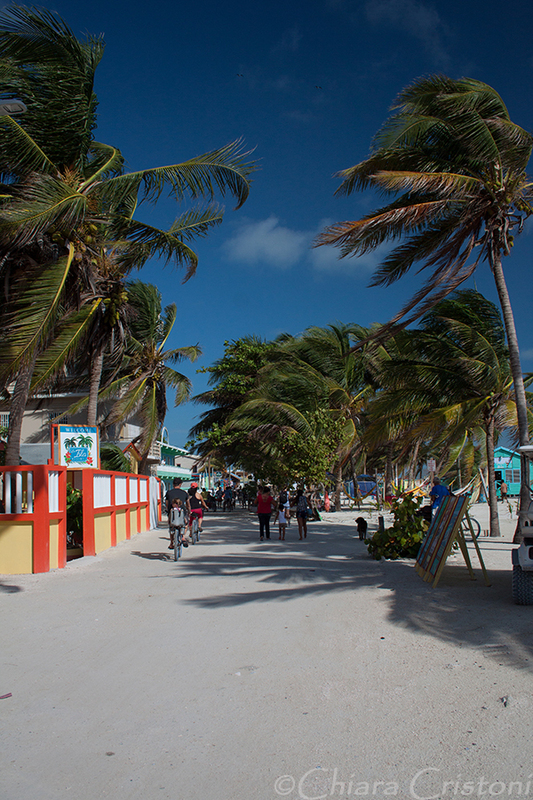 Or you can hire a bicycle and explore this tiny island (about 8Km long) on your own. 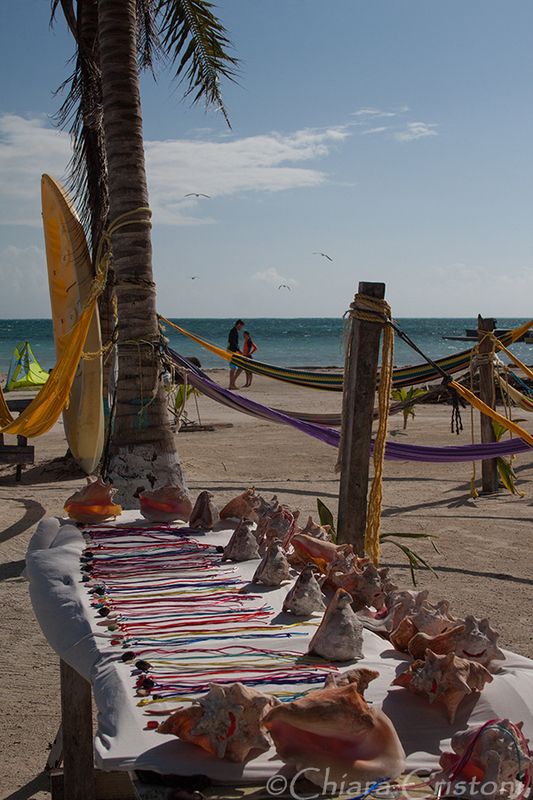 Or just sit by the beach and relax. 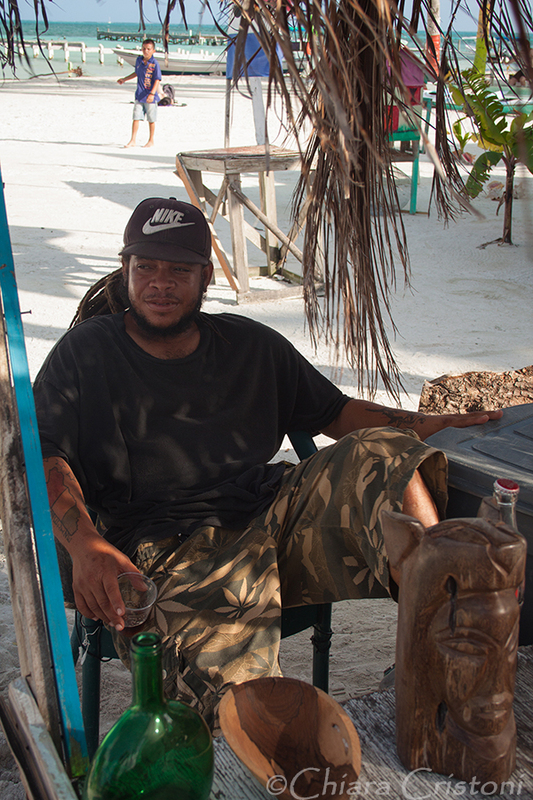 Everyone seems to go to the Split and the Lazy Lizard bar during the day and to the Sports Bar in the evening. 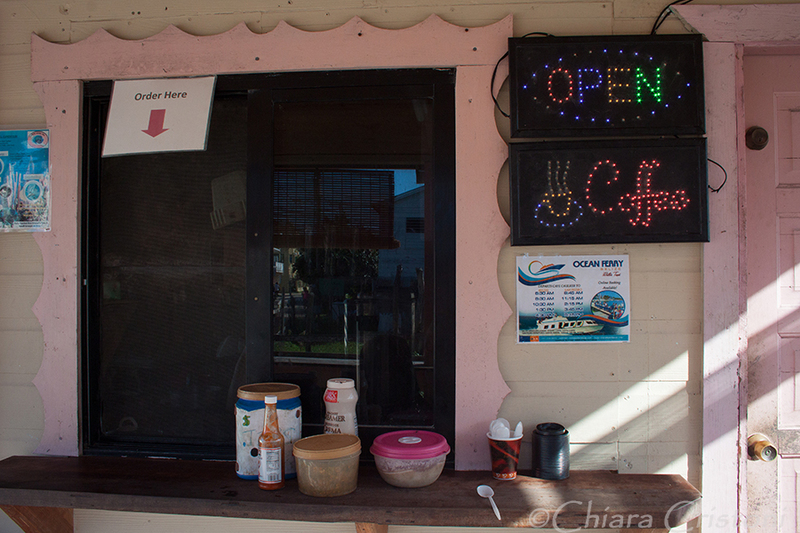 The local guys will tell you about the Sports Bar as soon as you arrive. 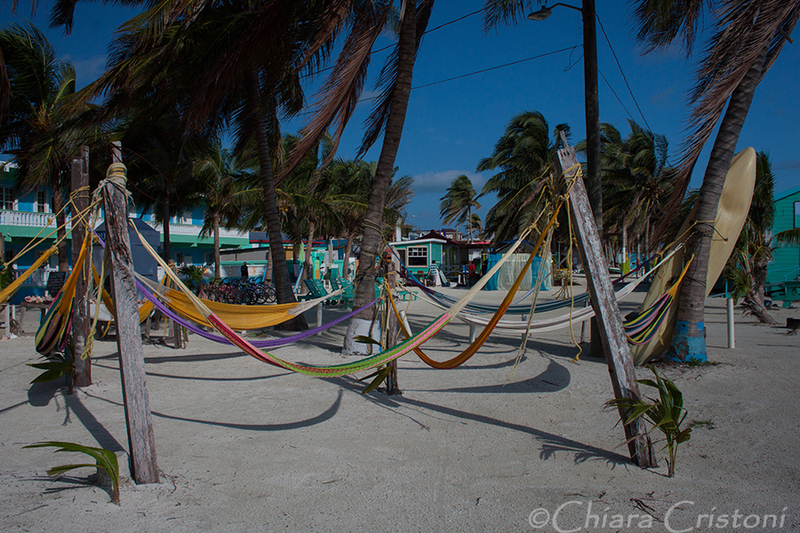 I fell in love with Caye Caulker. Small but with a lot to do if you are curious. 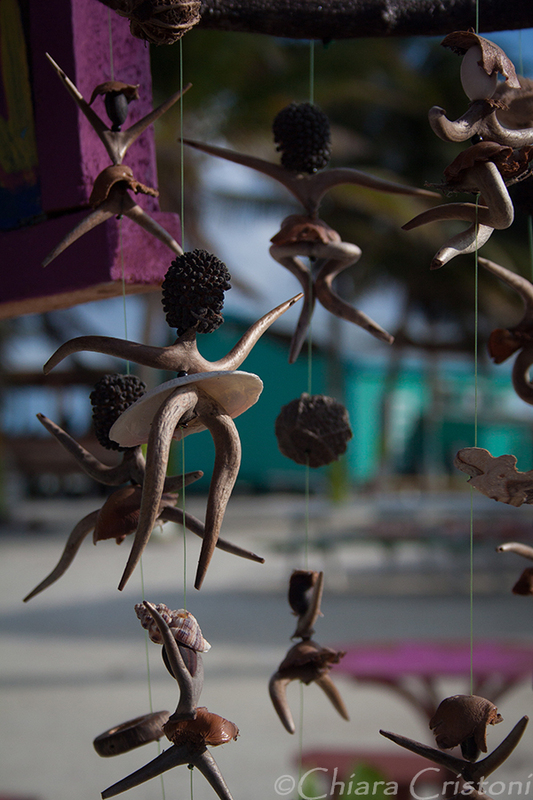 Explore the tiny island with a curious eye and an open mind. Enter the shops. Talk to the local people. Walk barefoot. 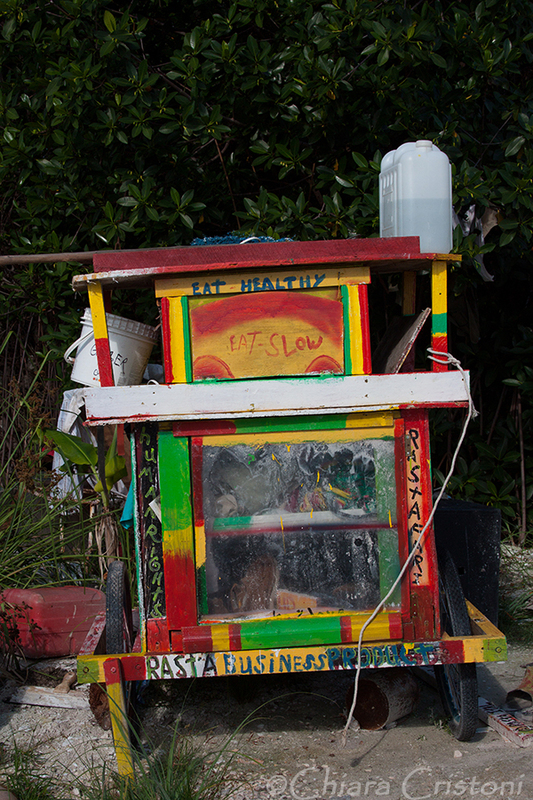 Buy a fresh juice from a grocery stall. Eat fryjacks. Take a yoga class. 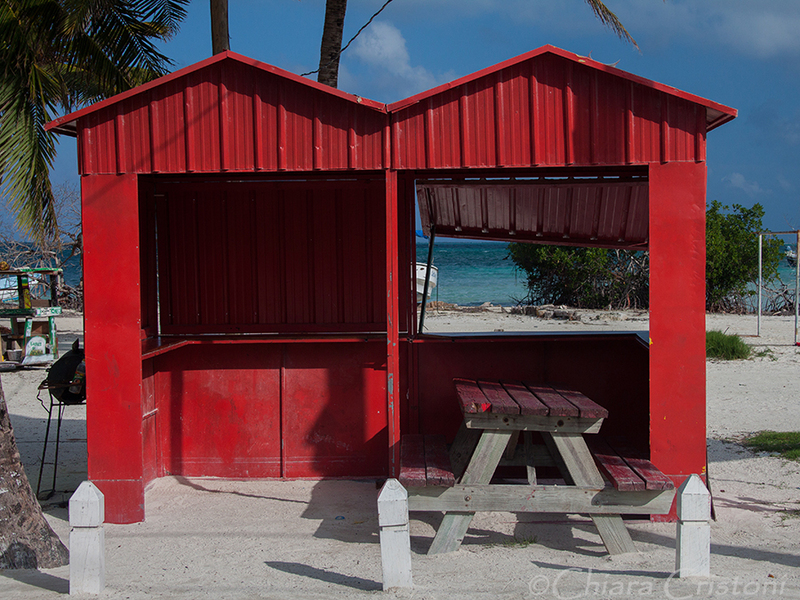 Hang out at the Split during the day. 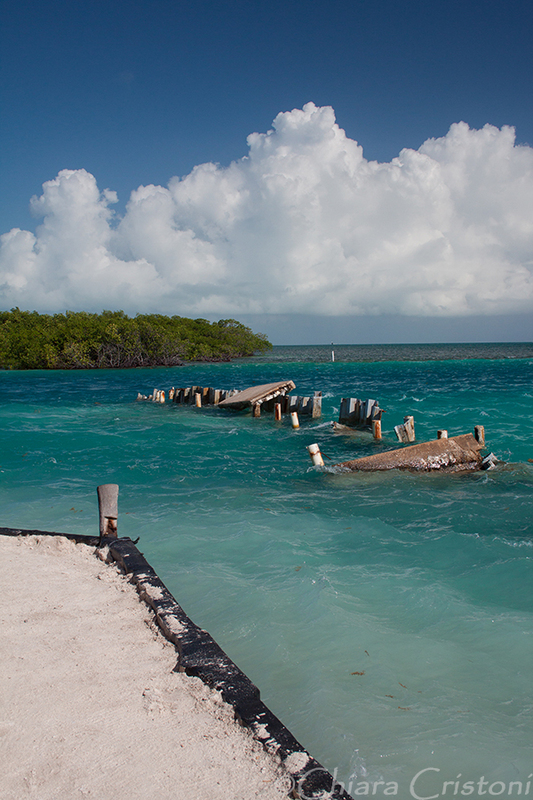 Swim in the clear Caribbean waters. Eat seafood. 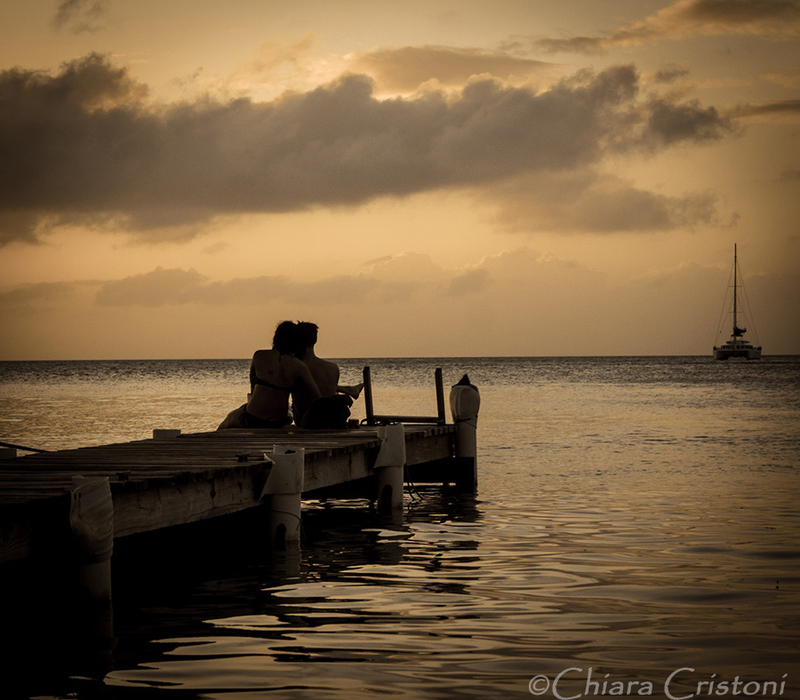 Watch the sunset. 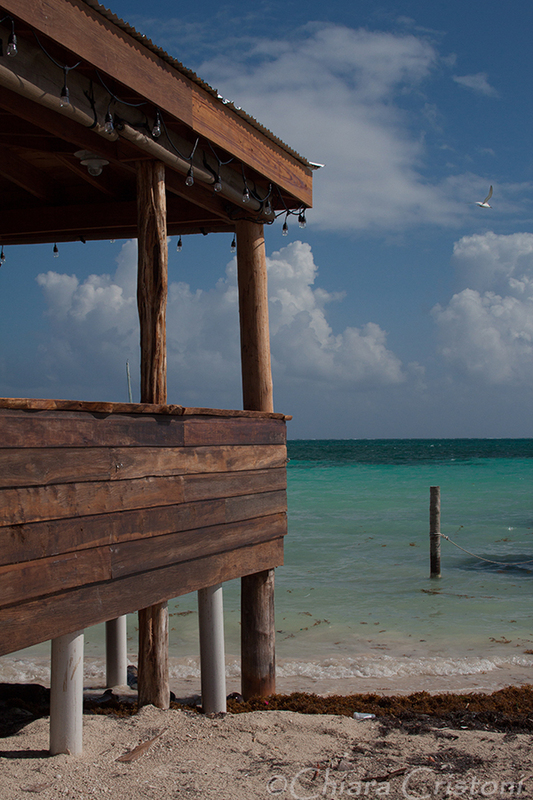 Enjoy the sea breeze. 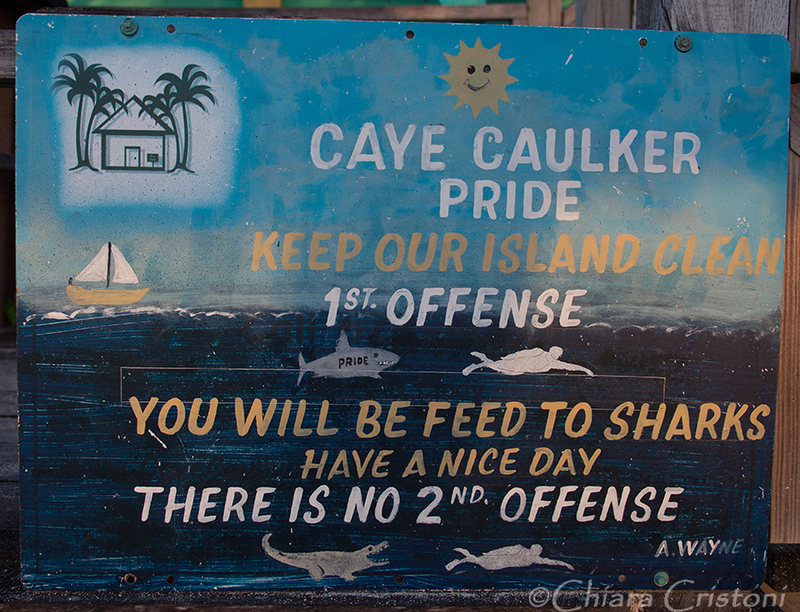 But most of all Go Slow and savour every moment in Caye Caulker. Because when you’re gone you will miss it. And more than you think. 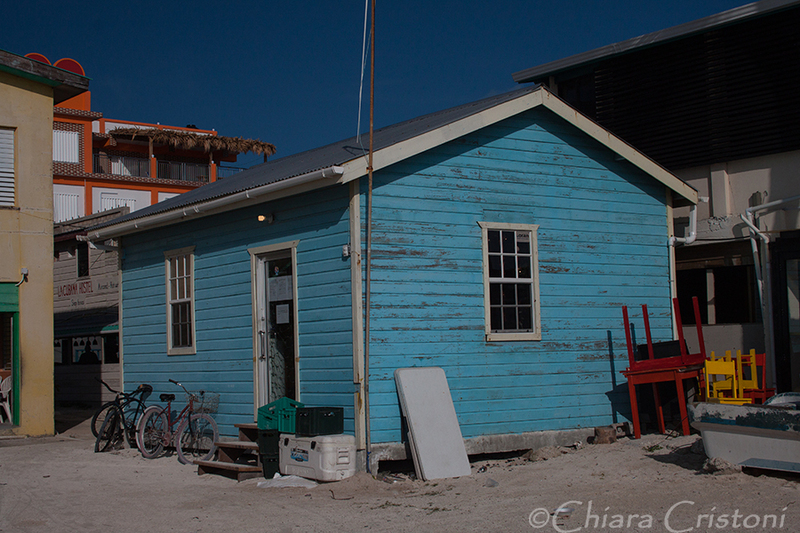 I wanted to go to Caye Caulker, the small Belizean island everyone was talking about. 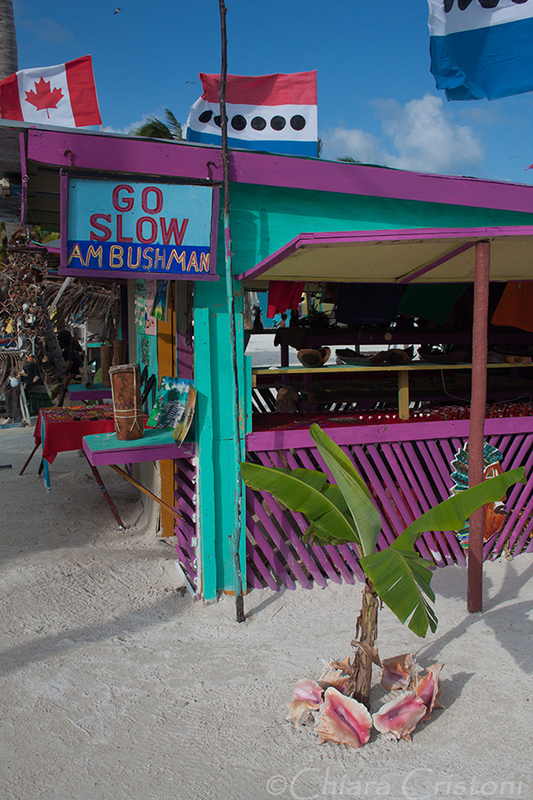 The “go slow” island. 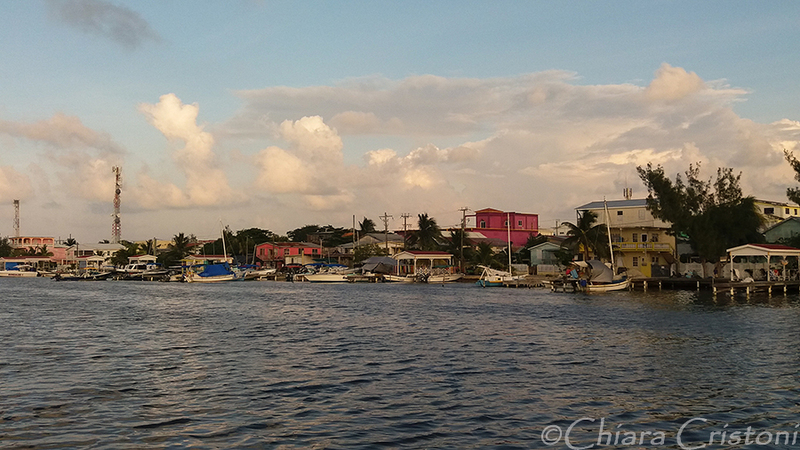 To get there I chose the water taxi route via Chetumal. 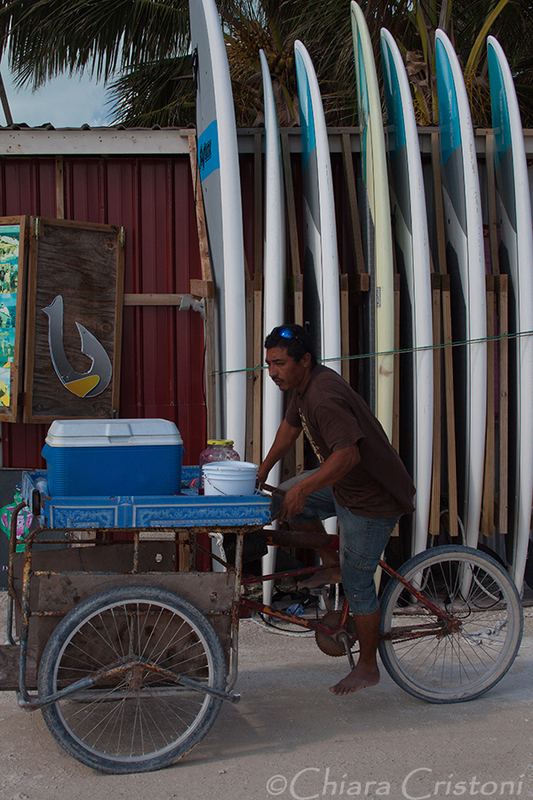 Two companies cover the international transfer from Chetumal to Caye Caulker and its larger neighbour San Pedro and they run one service a day, on alternate days. 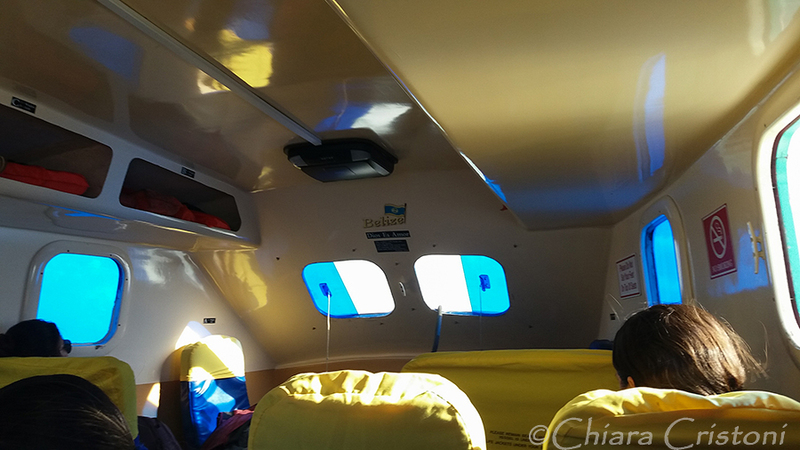 I traveled with San Pedro Water Jets and booked my tickets online (US$120 return!) a couple of weeks before travelling. I must say that I wasn’t particularly impressed by the lack of data and payment security in all transactions involved – hey this is the 21st century, why do I have to enter all my card details on an Excel spreadsheet that I am then expected to email back?! I had no choice though, either that or you have to turn up at the ferry terminal on the day and hope that there are seats available. 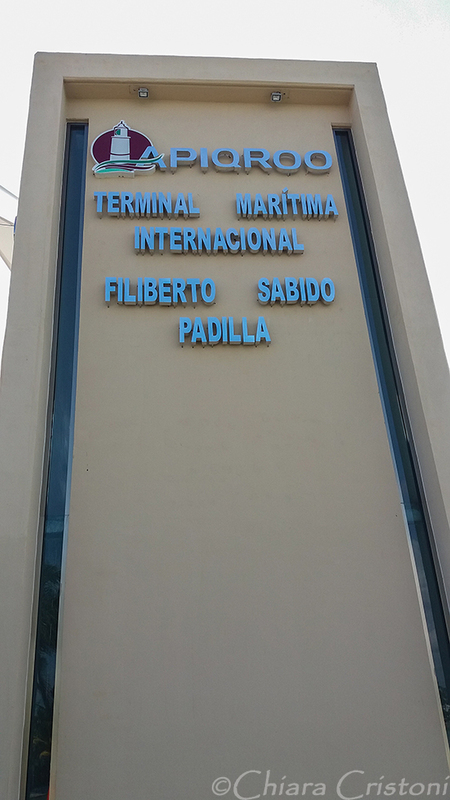 At the ferry terminal in Chetumal everything ran smooth, though, all was well organised albeit slow. Reservation checked, tickets picked up, luggage taken care of, speedy immigration checks to exit Mexico (leaving my wallet MEX$390 lighter!). 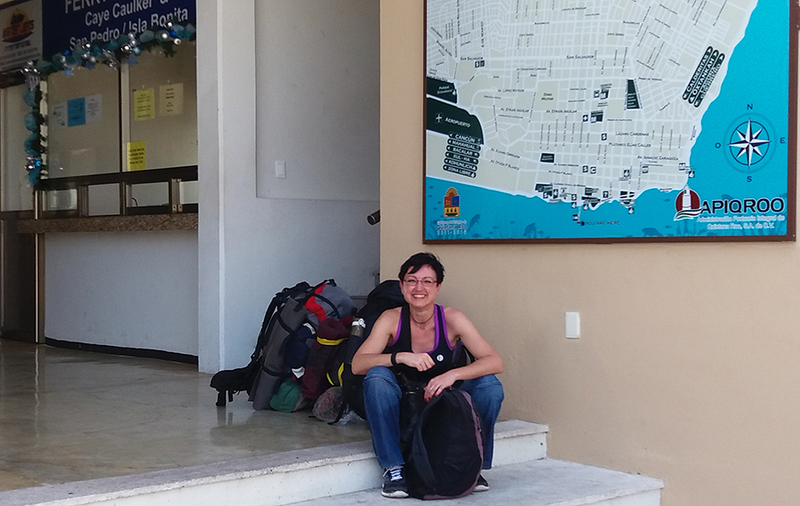 I am excited as about to reach country nr.40! Then an army van arrived. Three officers in camo uniform and carrying machine guns got off. What the heck is going on, I thought. Luggage inspection! 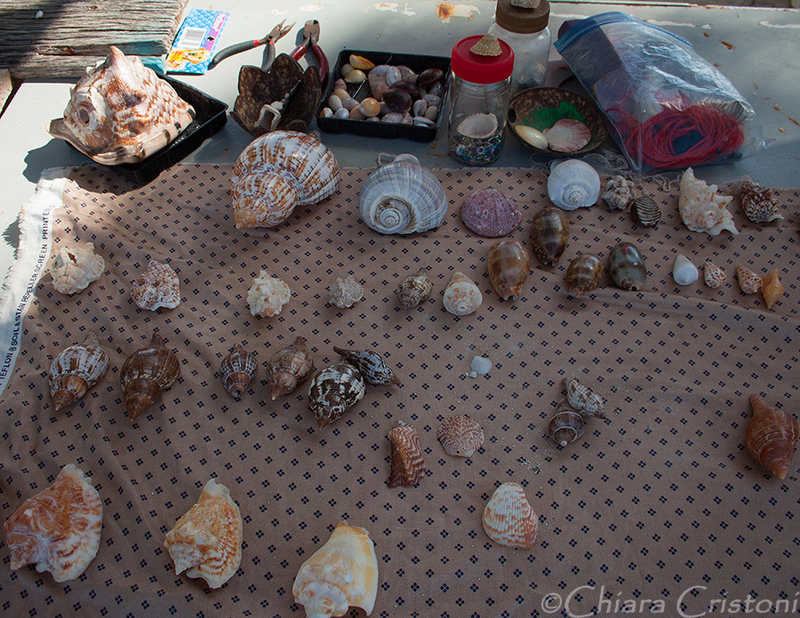 A slow process of checking our large bags, all lined up by the boat, started. The sniffer dog did the job. Three times. When done with the large luggage we were asked to line up all our hand luggage on the ground and stand behind it, at a distance. The dog walked up and down sniffing all small bags a few times. We were all curious and slightly nervous at the same time. No matter how certain you are that you are not carrying anything of concern, three Mexican army officers with machine guns are not your preferred sight… When one of the rucksacks was identified by the sniffer dog as potentially suspicious and the owner had to walk forward and open everything for further inspection, we were all watching on tenterhooks. It was like a movie. Eventually we departed. 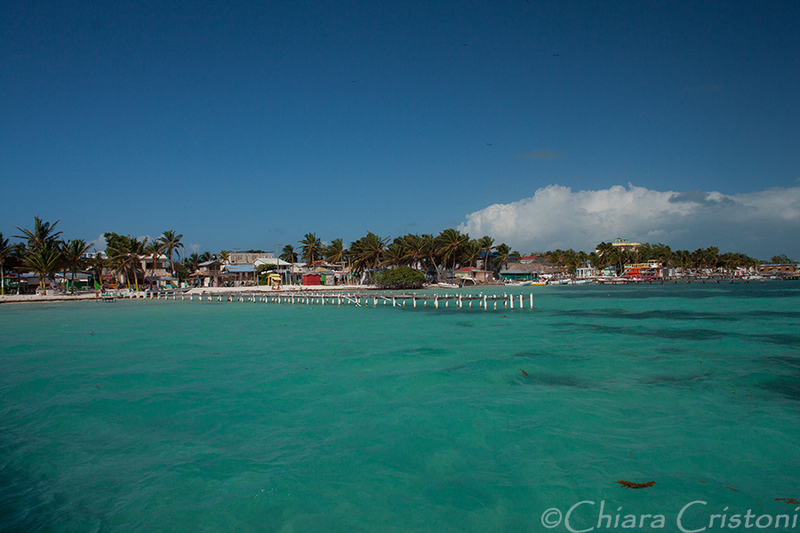 1.5hrs later we reached the island of San Pedro where we got off the water taxi and waited to have our names called one by one to create a line (it felt like being back to primary school…). 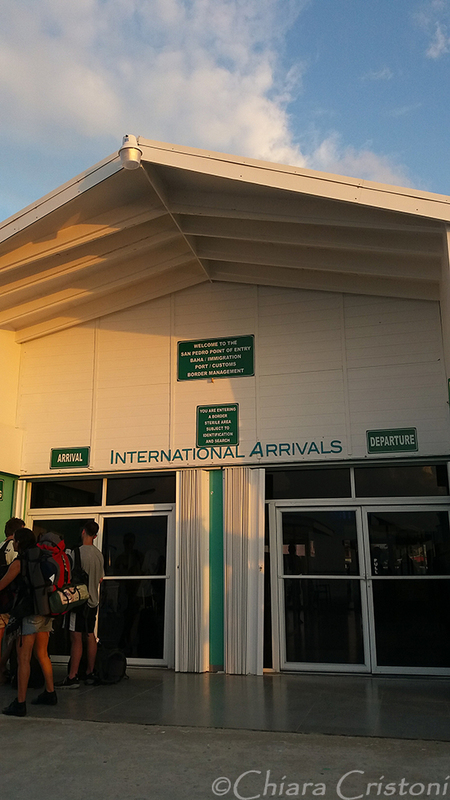 Inside the immigration building we had our passport stamped and the customs form taken, and paid US$1.5 for entry fee to Belize. 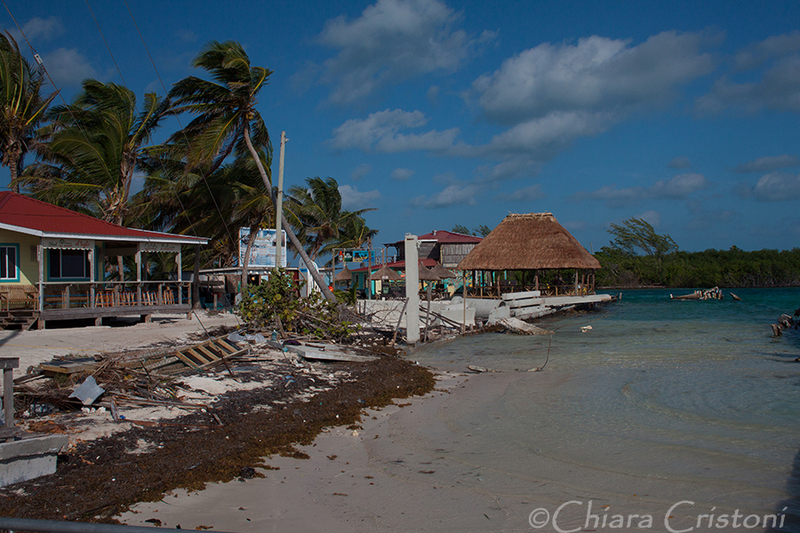 It took forever but eventually those of us who were continuing to Caye Caulker got on a smaller speed boat and after another half hour we reached our final destination. 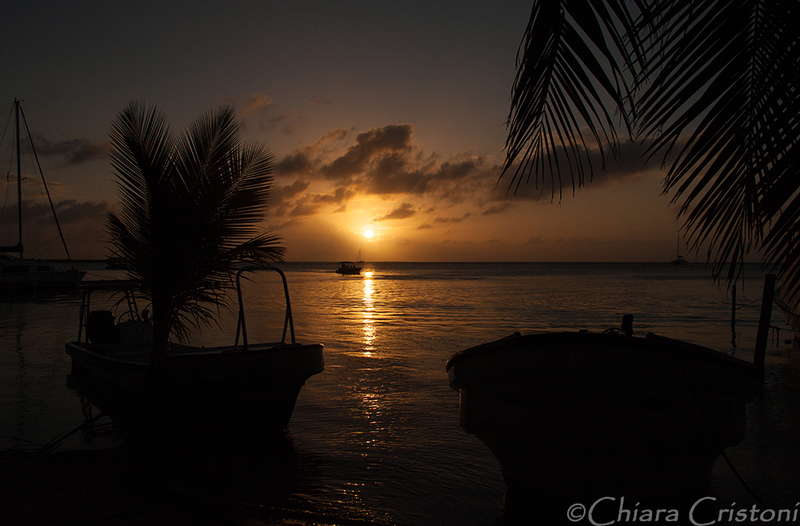 The sun had already set. So all in all everything ran smooth but the system seemed very old fashioned and extremely slow…and I thought that crossing the land border between Cambodia and Thailand had been snail-paced! 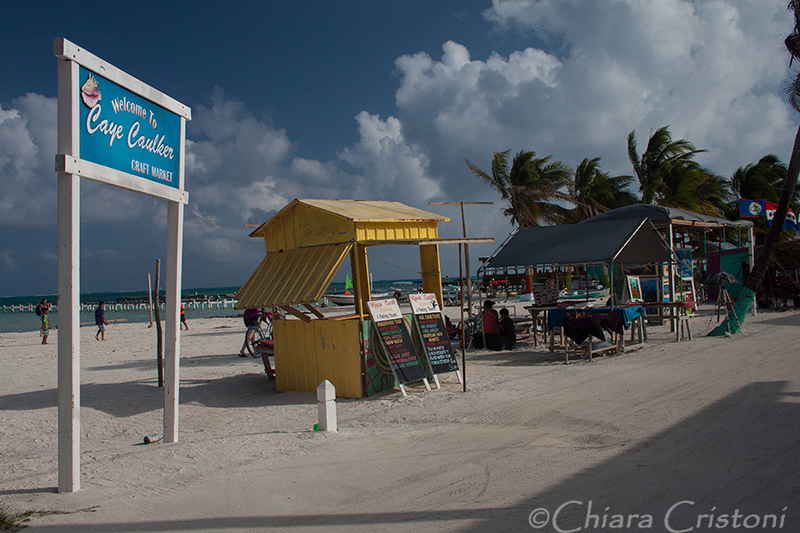 A few days later the return from Caye Caulker to Chetumal was done more or less in the same way, with an exit tax from Belize of US$20 and an entry tax to Mexico of MEX$390. 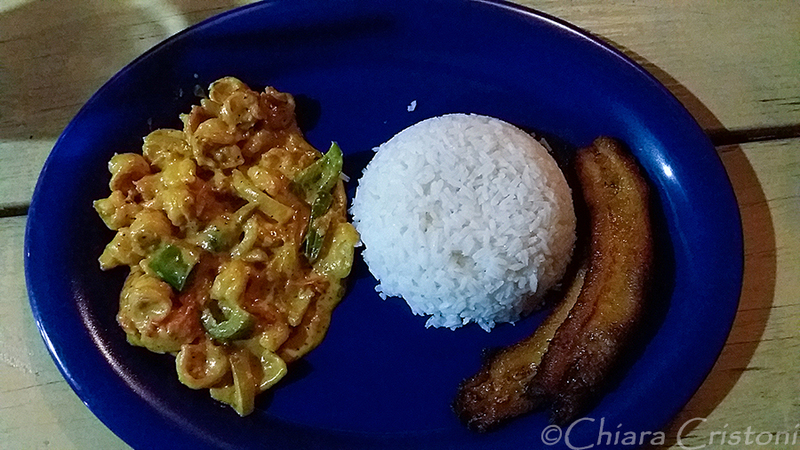 Quite an expensive part of my whole trip… But it was all worth it. And you’ll see why in my next post!